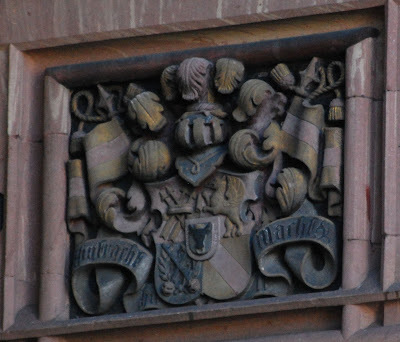 ,,, because there's just so very much heraldry to photograph, don' t you know, I came across two different but similar coats of arms in the city. Aren't these interesting? On different buildings, and they are different coats of arms, but the initial impression of them is that they are very similar. And, indeed, the third quarter of each coat (in the lower left as you look at it) are the same, and the fourth quarters (in the lower right) both have a field and a bend, though if the first coat is hatched properly, the colors of the shield and bend are different. The second quarter (in the upper right) appear at first glance to be the same, but in the upper coat, that quarter is the arms of the City of Heidelberg with the crowned lion atop a rock, while in the lower coat, the charge is a griffin. The first quarter of each coat (that in the upper left) is quite different in each case, the upper being a sword surmounted by a hanging balance and the lower being four arrows inverted in saltire. And, of course, the inescutcheons (the smaller shields overall) are completely different, as well, the upper one being a cypher (TR or possibly FR) and the lower one being a crowned bull's head cabossed, possibly within a bordure. Still, in looking through all my photos taken in Heidelberg, these two stood out to me as looking very similar, while being quite different.